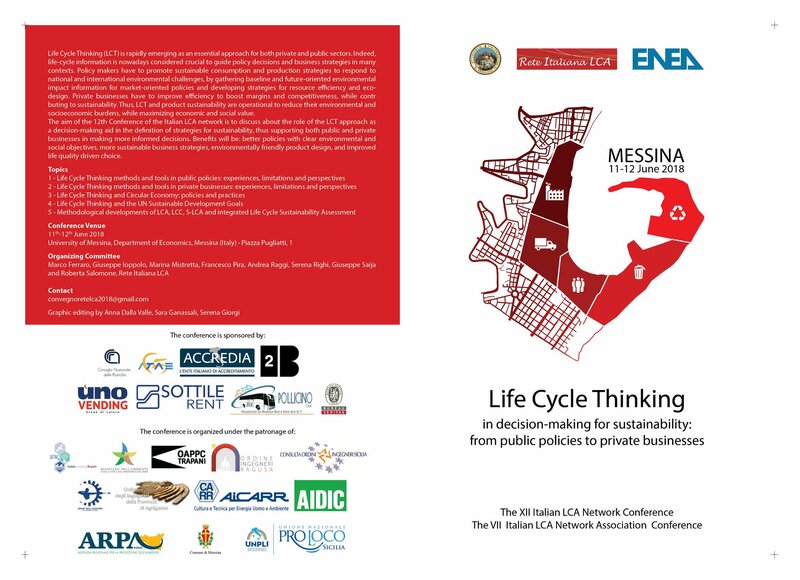 The Italian LCA Network organized the 12th Italian LCA Network Conference “Life Cycle Thinking in decision-making for sustainability: from public policies to private businesses” that was held in Messina on 11 and 12 June 2018. 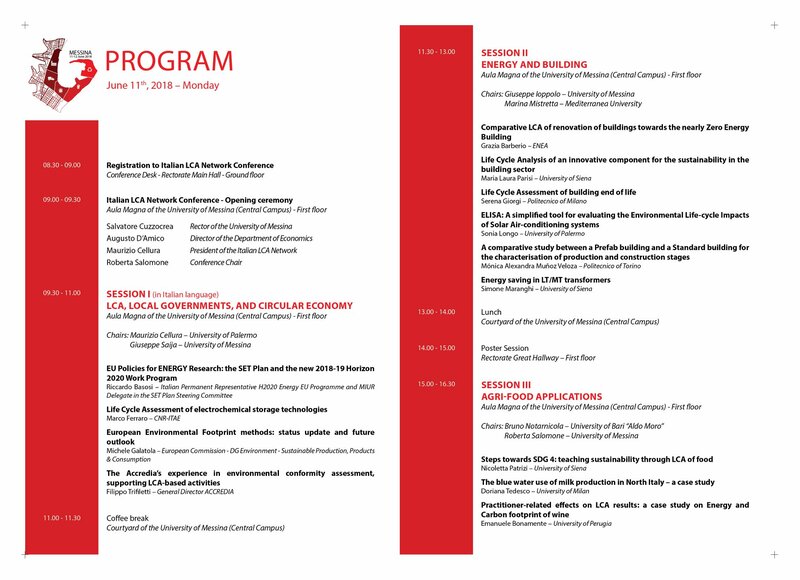 The aim of the conference was to discuss about the role of the Life Cycle Thinking approach as a decision-making aid in the definition of strategies for sustainability, thus supporting both public and private businesses in making more informed decisions. Life Cycle Thinking is rapidly emerging as an essential approach for both private and public sectors. Indeed, life-cycle information is nowadays considered crucial to guide policy decisions and business strategies in many contexts. Policy makers have to promote sustainable consumption and production strategies to respond to national and international environmental challenges, by gathering baseline and future-oriented environmental impact information for market-oriented policies and developing strategies for resource efficiency and eco-design. Private businesses have to improve efficiency to boost margins and competitiveness, while contributing to sustainability. Thus, LCT and product sustainability are operational to reduce their environmental and socio-economic burdens, while maximizing economic and social value. The benefits of applying a Life Cycle Thinking approach can be: better policies with clear environmental and social objectives; more sustainable business strategies; environmentally friendly product design, and improved life quality driven choice. 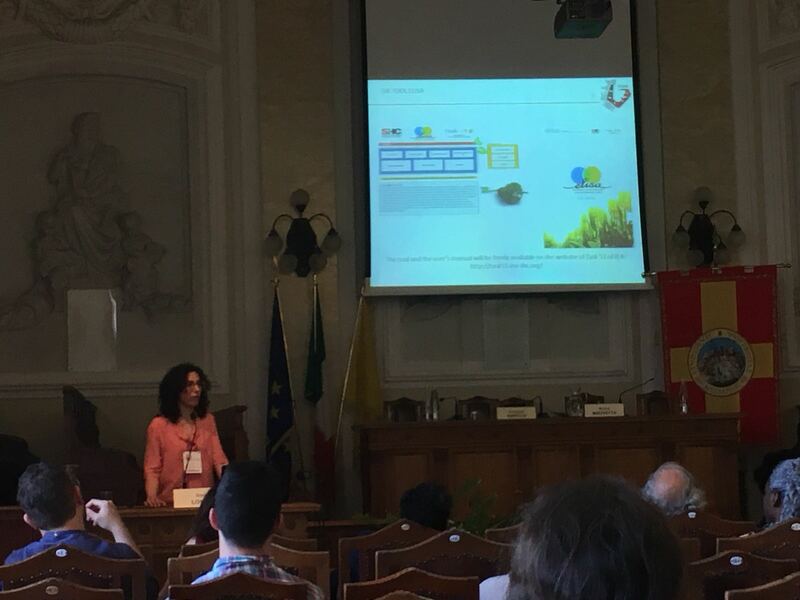 During the conference, we presented the tool “ELISA – Environmental Life-cycle Impacts of Solar Air-conditioning systems”, developed within the activities of Task 53. ELISA is a user-friendly tool to support the development of simplified Life Cycle Assessment studies during the design phase of solar heating and cooling systems. In detail, the tool can be used for estimating the environmental life-cycle impacts of solar air-conditioning systems and for understanding the potential energy and environmental benefits/impacts of the solar technologies in different geographic contexts if compared to conventional ones. Researchers, designers, and decision-makers can use ELISA to take environmentally sound considerations in the field of the SHC systems (PV or solar thermally driven systems).